A few days ago we posted a warning to folks that opened offshore bank accounts through a company called Sovereign Management & Legal, Ltd. Based in Panama, the company offers to help Americans open offshore bank accounts with nominee corporations. Knowing that many people who do take these actions are also committing tax evasion, the IRS and Justice Department obtained a John Doe summons from a federal judge. The IRS hopes to find Americans who used Sovereign to open accounts. Opening an offshore account isn’t illegal. Tax evasion and willfully failing to report an offshore account are felonies, however. Curious about the services offered by Sovereign, we visited their website. One of the services offered by Sovereign is an “anonymous offshore ATM / debit card.” Long associated with tax evasion, offshore debit cards are a popular way for people with hidden assets to repatriate their money into the United States. Transferring money into your US account would leave a paper trial but an anonymous debit card allows one to spend money in the United States and make ATM withdrawals with very little paper trail. Sovereign advertises that their cards have neither a name imprinted on them nor encoded in their magnetic strips. Of course, to open a foreign bank account most foreign banks want to see a passport. Sovereign has that covered too. 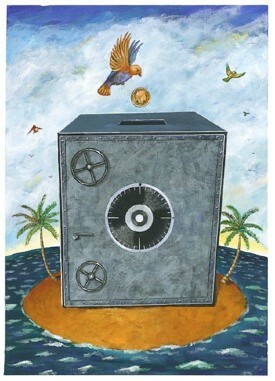 For a fee, Sovereign Management offers “aged” offshore shelf corporations that already have bank accounts. Why present a passport when you can buy a company “off the shelf” that already has an offshore account? Worried that you might lose control of your funds or your offshore shelf company? Sovereign has an answer for that too. Their nominee directors come with undated resignation letters. For a mere $3,500 (US), you can own a ready made Nevis corporation owned by a Panamanian foundation, complete with bank account. An aged company or one with nominee directors is extra, of course. While none of these things alone are illegal, the IRS considers them to affirmative acts of tax evasion. Unless you have some valid business purpose, having a nominee entity will at a minimum get you audited and if you get caught with an unreported foreign account, may get you a trip to Club Fed. Is there a risk of getting caught? Absolutely! In the case of Sovereign, because they are located in Panama, their customer lists are beyond the reach of the Justice Department. The courier companies like FedEx, however, can be subpoenaed and they carry checks and incorporation papers back and forth to Sovereign. The foreign banks themselves are now doing a little of digging to see who actually owns and controls the accounts held in nominee names. And the major credit card companies and ATM networks have records too. Ultimately, the promoters of these offshore shelf companies may or not get in trouble for helping Americans move money offshore. Those that used their services, however, may be in real trouble unless they are in full compliance with FATCA and foreign reporting rules. There are plenty of great reasons to have an offshore account. Just don’t get fooled by a sale pitch suggesting your account is truly anonymous. If you open an offshore account, report it yearly! All inquiries kept in complete confidence and protected by the attorney – client privilege.